The Resource Stewardship Scout Ranger program invites Scouts and Cub Scouts to participate in educational and/or volunteer service projects at national park sites. The goal is to spark the Scouts' awareness of the national parks while giving them the opportunity to explore the parks and learn more about protecting our natural and cultural resources. Scouts are awarded certificates and/or patches for participating in the program. To earn a troop certificate, troops must participate for a minimum of five hours at one or more national park sites. To earn a patch, Scouts must participate for a minimum of 10 hours at one or more national park sites. 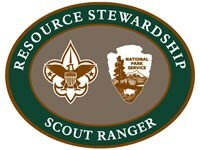 For more information, visit www.nps.gov/subjects/youthprograms/scout-ranger.htm. Additional information may be found at www.nps.gov/fost/learn/kidsyouth/upload/Scout-Ranger-Brochureonepage7-20-09-2.pdf.